Mariano Del Rosario, Love Gun (after Albert King), 2015, Cement, rhoplex, and acrylic on canvas, 36 x 36 inches. The art of collage is a springboard for many possibilities. The Collage and Assemblage class focuses on compositional and technical skills. Juxtaposition and synthesis are emphasized as well as surface preparation, transformation, and innovation. Through ideas and strategies, the student learns how to create exciting and well articulated art forms such as collage, assemblage, new genre, and other mixed media projects. Theory and the creative process are given weight, as are presentations and critiques related to the most significant events in contemporary art. These are offered with the aim of incorporating new ideas into personal imagery. Materials are unrestricted. Beginning and advanced levels are welcome. Students in this class create work without using models or still life. 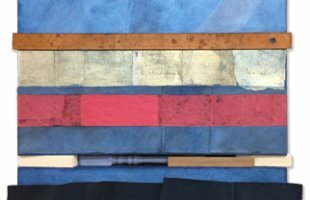 The Mixed Media class includes mid-level and advanced students, as well as exhibiting artists who wish to move their art to the next level: painters, constructionists, conceptualists, quilters, assemblagists, and multimedia and installation artists focusing on individual direction. Through feedback, the instructor offers advisement and critique to further personal vision and aesthetic vocabulary. Some tools are available for three-dimensional projects. Use of any material, including found objects or reclaimed materials, is encouraged. Born in the Philippines, Mariano Del Rosario is a painter and installation artist who lives in Brooklyn, New York. He holds a MFA degree in painting from Maryland Institute College of Art and a BFA degree in painting from the University of the Philippines. Selected solo exhibitions include OK Harris Gallery, New York City; Roger Smith Arts, New York City; Galeria Galou, Brooklyn, NY; David Klein Gallery, Birmingham, MI; Soho Center for Visual Artists, New York City; Andrea Gallery, Washington, DC; Hunter College Gallery, New York City; and the Cultural Center of the Philippines, Manila. Selected group exhibitions include Fundacao Eugenio de Almeida, Evora, Portugal; KW Institute for Contemporary Art, Berlin, Germany; Zentral Bibliothek, Zurich, Switzerland; National Library, Buenos Aires, Argentina; Shore Institute of Contemporary Arts, Long Branch, NJ; Leroy Neiman Art Center, Bronx, NY; Goliath Visual Space, Brooklyn, NY; Affordable Art Fair, New York City; Queens Museum of Art; Baltimore Museum of Art; Rotunda Gallery, Brooklyn, NY; Butler Institute of American Art, Youngstown, OH; APA Gallery, New York University; Tokyo Art Expo; Bronx Museum of the Arts; Everson Museum of Art; Glassell School of Art, Houston Museum of Fine Arts; School 33 Art Center, Baltimore, MD; Museum of Philippine Art, Manila; National Museum of Thailand, Bangkok; and Hong Kong Art Centre, Hong Kong. Selected grants and awards include the Asian Cultural Council/Rockefeller Brothers Fund; the Pollock-Krasner Foundation; Thirteen Artists, the Cultural Center of the Philippines; Aljira, a Center for Contemporary Arts, Newark, NJ; BCAT/Rotunda Residency, Brooklyn, NY; Best in Show, Washington Square East Galleries, New York University; and Grand Prize, Embassy of Spain, Manila, PH. He is listed in Marquis Who’s Who and is represented in numerous private and public collections.